When the release of Kevin Tong's cool Gravity poster for the collectible arthouse Mondo came along, there were rumblings that another piece would be coming this week since Thor: The Dark World hits theaters with evening showings tomorrow night, and they have been confirmed. Ken Taylor has crafted a stellar poster for the Marvel sequel showing some pretty serious destruction in Asgard, as Thor looks on, seemingly helpless, but not defeated as his cape blows tattered in the wind, Mjolnir firmly in his hand. It's a gorgeous piece of work, but the color scheme just isn't my cup of tea. But if you want it, tomorrow is your day. Look! The print is a 24×36 inch screenprint with the right being an edition of 400 for $50 and the left being a variant edition of 175 that will cost $75. The print goes on sale at a random time Thursday, November 7th. 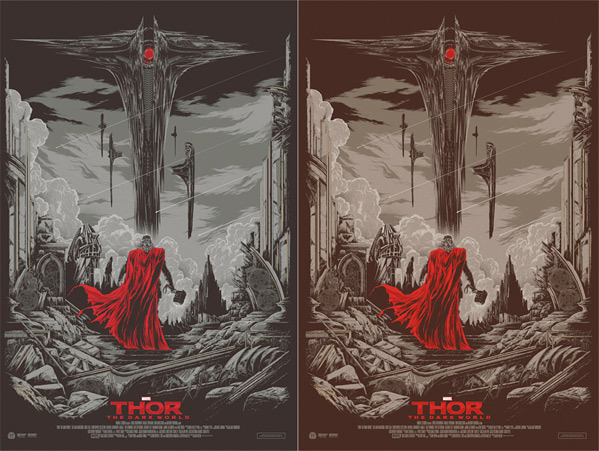 Follow @MondoNews to learn when, and check your local listings for Thor: The Dark World showtimes. I like the "cool" one more. Makes the cape pop.